Reps summon health minister, asks him to reinstate NHIS boss – Royal Times of Nigeria. 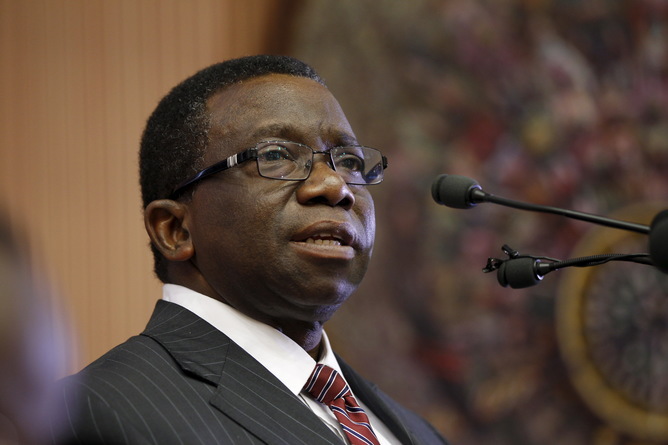 The House of Representatives on Wednesday summoned the Minister of Health, Prof. Isaac Adewole, over the suspension of the Executive Secretary of the National Health Insurance Scheme, Prof. Yusuf Usman. The lower chamber asked the minister to reinstate Usman within seven days and halt the re-accreditation of Health Maintenance Organisations. Prof. Usman was suspended for alleged corrupt practices contained in petitions, one of them being that he procured a Sports Utility Vehicle for N58m without due process. Prior to his suspension, Usman had earlier appeared before a committee of the lower chamber, where he blamed the failure of the NHIS on the HMOs. Lawmaker from Imo state, Hon. Chike Okafor who moved the motion said the ES was being punished for exposing corruption in the NHIS during his speech at the committee hearing. His motion read in part, “The House was shocked by the testimony and revelations by the ES during the hearing, where he decried the corruption being perpetrated by the HMOs. “He likened it to the fraud in the fuel subsidy scheme, stressing that they were padding figures of enrollees so that they could get paid. The House resolution read in part, “Invite the Minister of Health, Prof. Isaac Adewole, to show cause why he should not be cited for contempt of the House as the suspension of the Executive Secretary of NHIS, Prof. Usman Yusuf, appears to be intended to intimidate him, punish him for testifying before the House and silence him from further testifying before the House of Representatives, in its constitutional duties of investigation of issues of corruption, inefficiency and waste in governance. “Request the minister and the acting Executive Secretary to stop henceforth every process of HMOs re-accreditation, pending the outcome of the ongoing investigation mandated by the House.